MiraDry targets the glands under the arms that produce sweat and odor. MiraDry administers thermal energy to the underarm area that selectively destroys sweat glands below the surface of the skin. The energy reaches a precise depth, and does not damage lymph nodes or other, deeper structures of the dermis. During treatment, the device simultaneously cools the top layers of the skin to minimize discomfort. 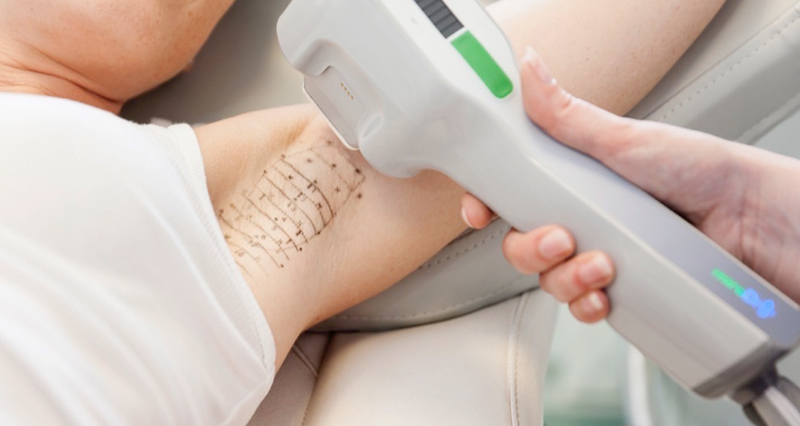 The FDA has cleared MiraDry to safely reduce underarm sweating, hair and odor. It has an excellent safety profile when used appropriately. Like any medical procedure, it’s important to work with a physician that can help you determine if the procedure is appropriate and safe for you. MiraDry treatment is well tolerated. During treatment, you will lie comfortably on your back with your hands under your head, to expose the underarm area for treatment. After ensuring that the underarms are numb using tumescent lidocaine, the MiraDry hand-piece delivers energy that targets and destroys sweat glands non-invasively. You should not feel any discomfort during treatment. The entire procedure takes about an hour. MiraDry requires limited downtime. Patients can expect redness, swelling and tenderness immediately following the procedure, which decreases significantly over the next few days. Swelling can be significantly minimized by icing the area frequently during the first 24 hours after treatment. For this reason, we recommend going home after treatment to ice the underarms. Most patients return to normal activities the next day, but we do recommend a break from rigorous activities for several days after the procedure. MiraDry permanently destroys sweat glands. Significant reduction in underarm sweat and odor takes effect immediately. Most patients are happy with results from one treatment, and find sweat no longer saturates clothing, and anti-perspirant and deodorant products become unnecessary. Some patients choose a second treatment for absolute maximum results. The MiraDry treatment also causes a reduction in underarm hair. The FDA clearance indicates MiraDry treatment ultimately removes 60-70% of hair of all colors. Our state-of-the-art laser and devices center is led by Dr. Sue Ellen Cox, a core aesthetic physician and published expert in these treatments.